Did you know that March is Nutrition Month? Just in time for the end of it, I've got a great grocery card giveaway for you, as well as a fabulous new online resource recently launched by Healthy Families BC. The website is called Shopping Sense & it was developed to help shoppers learn the how to make healthier, budget-wise options for their families. Shopping Sense is really easy to use. 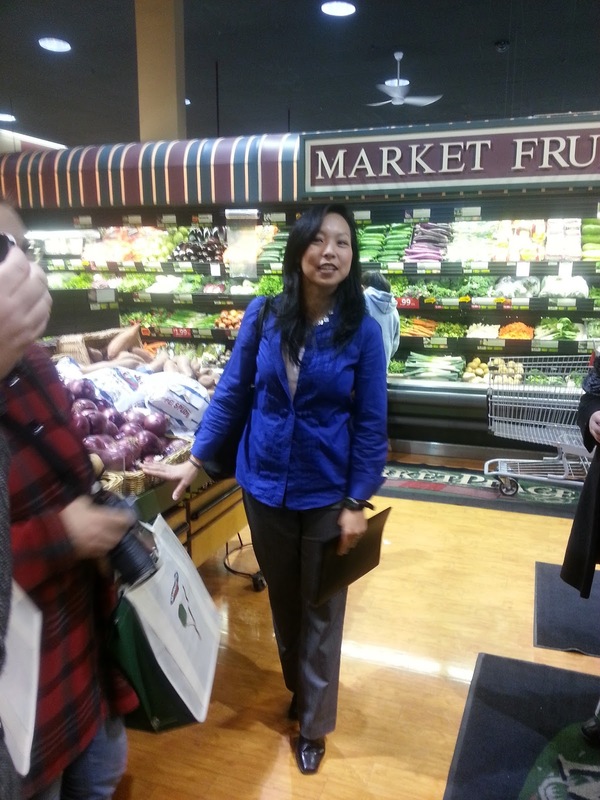 It includes fun virtual tours of grocery store departments led by Global TV’s Registered Dietitian Melodie Yong, full of great shopping tips. What I love about it, is that it gives you great tips on how to feed your family great healthy food without breaking the bank. I was lucky enough to get the live version of the tour with Melodie at our local Marketplace IGA store a few weeks back. Always read the label on packaged foods. Avoid buying products with ingredients you can't pronounce or huge long ingredients lists. Numbers in the ingredients? Stay away from it! Look at fibre on the nutritional info charts. Adults should aim for at least 25g of fibre a day--check how much there is per serving of bread or crackers, for example, & if you're comparing, remember to check how many slices/pieces are in a serving. It's not standardized. How much sodium is in it? 1500mg is the recommended daily maximum for adults & for children it's much lower. It's surprising which foods have a lot of sodium sometimes--bread can be a bad one. Is it high in fat, & if so, is it trans fats, saturated or unsaturated? The first two are bad, basically, so avoid them when you can. Again, watch the serving sizes when comparing. How much sugar is in it? Sugar is a sneaky one like sodium. Things that don't necessarily taste that sweet can have tons of sugar, like ketchup. To get a sense of what X number of grams of sugar really means, keep in mind that 4g is the equivalent of a sugar cube. In some pops like Coke, there can be TEN or ELEVEN sugar cubes per serving. Another thing Melodie highlighted on our tour is something you can use too: a simple printable meal planner and shopping list. It allows you to plan your meals for the week, make a coordinating shopping list, and have everything organized in one place, so you don't end up coming home with a ton of stuff that won't work together to make decent meals. You've got four ways to enter--the more you do, the better your chances. Don't forget to do the action (follow me on Twitter or FB, etc) & then click 'I did it' so Rafflecopter counts your entry as valid. As always, please contact me if you have any issues with Rafflecopter: lisa.corriveau AT gmail.com. Good luck! Disclaimer: I received a $100 grocery card as compensation for writing this post & hosting the giveaway. I too am trying to plan a week's worth of meals at a time to save on $$ and trips to the store. The meal planner seems quite handy. I enjoyed reading that kids and adults don't get enough produce and how much we should be having daily. The tips; like learning that shopping when one is hungry or tired can lead to impulse purchases. I like the virtual tour that has great tips and videos! My favourite part of the website is the tips - there's so many useful tips! I like the helpful tips about nutrition and to read the labels. I like the pre-planned meals and grocery lists. That makes my life way easier. Or rather, my husband's, as he is the cook of the family! Meal planner! I always have such good intentions but I get easily sidetracked. I'm not particularly great at meal planning so the meal planner was good. The videos and tips were informative. Yum ...Nutrition. Thanks for the post and links.